One of the great puzzles of evolutionary biology is what induced certain living creatures to abandon solitary existence in favor of living in collaborative societies, as seen in the case of ants and other social, colony-forming insects. 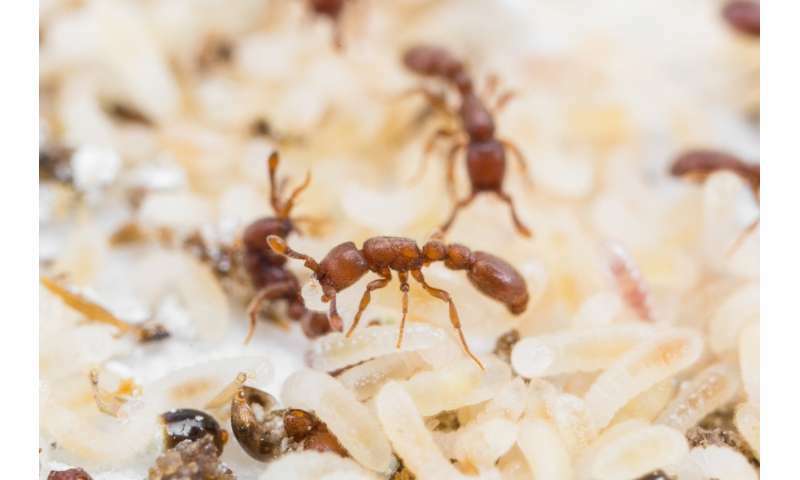 A major characteristic of so-called eusocial species is the division of labor between queens that lay eggs and workers that take care of the brood and perform other tasks. But what is it that determines that a queen should lay eggs and that workers shouldn't reproduce? And how did this distinction come about during the course of evolution? Evolutionary biologist Dr. Romain Libbrecht has been considering these problems over the past years and in cooperation with researchers at Rockefeller University in New York City has found a completely unexpected answer: one single gene called insulin-like peptide 2 (ILP2), which is probably activated by better nutrition, stimulates the ovaries and triggers reproduction. "It may seem almost inconceivable that just one single gene should make all the difference," Libbrecht pointed out. The researchers drew their conclusion from a comparison of 5,581 genes in seven ant species in four different subfamilies that differ from each other with regard to numerous characteristics. But in one thing are they all alike: there is always a greater expression of ILP2 in the brain of reproductive insects. Queens thus have higher levels than workers. A further finding indicates that this peptide is found only in the brain, where it is produced in a small cluster of just 12 to 15 cells. It is postulated that the origins of social behavior in insects are to be found in wasp-like ancestors that alternated between reproduction and brood care phases. A female wasp would lay an egg and take care of the larva until it pupated. However, these two phases were separated and their associated duties assigned to different individuals, namely queens and workers, during the evolution of eusociality. Libbrecht and his colleagues in New York City investigated the ant species Ooceraea biroi to determine the molecular mechanisms underlying this division of labor. O. biroi is a small species of 2 to 3 millimeters in length that originated from Asia but has spread throughout the tropics. The insects live in underground passages, attack the nests of other ant species, and feed on their brood. The unusual thing about the O. biroi species is that there are no queens, only female workers. However, every female worker can reproduce through parthenogenesis. This means that a female produces another identical female—the insects in effect clone themselves. And they always follow a specific cycle: all female workers lay eggs during an 18-day period, after which they spend 16 days gathering food and feeding the larvae. The cycle then begins once again. This cyclical behavior is comparable to that of the solitary wasp-like ancestors and is controlled by the presence of larvae. When the first larvae hatch at the end of the reproductive phase, their presence suppresses ovarian activity and triggers brood care behavior. When the larvae begin pupation at the end of the brood care phase, ovarian activity is scaled up and foraging scaled back. "What we did was break this cycle," explained Libbrecht. 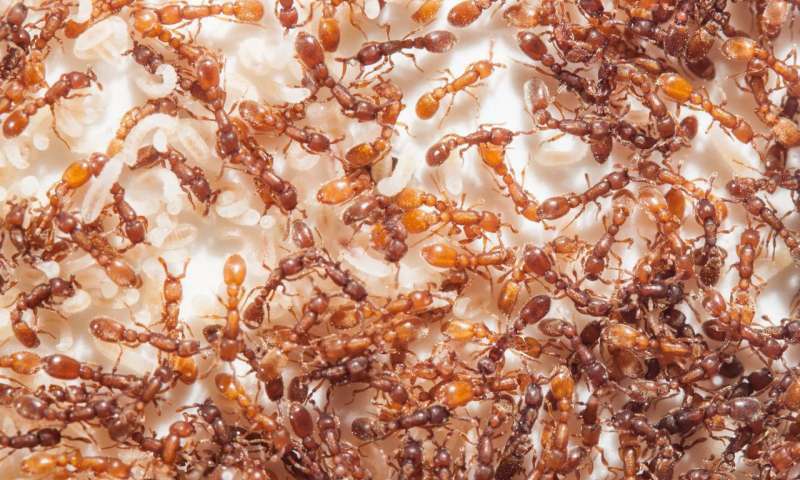 The researchers synthesized the peptide ILP2 and injected it into the ants. This caused the ants to lay eggs in the presence of larvae. Libbrecht used a brood substitution approach to investigate what happens when larvae are introduced into the colony during the reproductive phase and, conversely, when they are removed during the brood care phase. "What we see is that gene expression in the brain changes in both phases and the ants change their behavior and physiology accordingly. This response, however, happens at a faster rate if we confront egg-laying ants with larvae." The insects then stop laying eggs and start to care for the brood. "This does make sense. It is, after all, important for survival to quickly start feeding the larvae," he added. This experiment also revealed that the expression of ILP2 in the brain changed quickly and significantly in response to the change in social conditions. The researchers also considered the relevance of nutrition, which is known to be of importance when it comes to the differentiation between queens and workers. A large quantity or a good quality of nutritional protein favors the development of female larvae into queens. In colonies of the species O. biroi, a small proportion of the ants are so-called intercastes. These insects are slightly bigger, have eyes, and are more reproductive. Because of this, they can be compared to some extent with normal queens. The probability of a larva becoming an intercaste increases if it receives better nourishment. Fluorescence imaging shows that these intercastes have more ILP2 in their brains than normal workers. "Something comparable may well have taken place in the case of the ancestors of eusocial insects," Dr. Romain Libbrecht suggested. "Perhaps a minor asymmetry with regard to nutrition of larvae led to asymmetry in the reproductive behavior of adults developing from those larvae." The assumption that the division into queens and workers might therefore have commenced with one single difference is supported by experiments conducted in a total of seven different ant species. Further research is to be undertaken to determine whether the findings also apply to other social insects and how ant colonies as superorganisms control the overall supply of nutrition.